Okay friends, it’s March already and that means Playing for the Cure: Brainstormin’ is quickly approaching! Through the Musicians of North Haven, fundraising is underway for a benefit concert at Stony Creek Brewery on September 16, 2016. In partnership with the Yale School of Medicine, I am pleased to share with you that all donations are now tax deductible. As in the past two years, one hundred percent of the profits will be donated to The Cusano Family Brain Tumor Fund at the Yale Brain Tumor Center. What exactly is The Cusano Family Brain Tumor Fund? The concept of the fund was first announced by my surgeon during our first Brainstormin’ concert in 2014. For the previous three years, Stephen and his friends performed concerts on the North Haven Town Green and donated the money raised to the town’s music department. After the 2013 concert, Stephen and my family approached me with the idea of doing a concert for the benefit of Yale and as a way of saying “thank you” for my renewed lease on life, and I was in total agreement. I did some thinking and researching of my own and came across the Nora Brignolo Fund. This fund was managed by my surgeon and used for research and the development of clinical trials for brain tumor patients and within no time, we decided to organize a concert and give the money to this fund. However, as this video evidences, the donation to the Nora Brignolo Fund turned into a donation to The Cusano Family Brain Tumor Fund and none of us has ever looked back. My family and I have continued to earmark all of the profits from this concert to Yale because, very simply, my surgeon saved my life and without his care and the support of the many doctors at Yale, I would not be here. I am forever grateful for the care I received and our goal is to help others fighting this difficult diagnosis. How are the donated funds used? 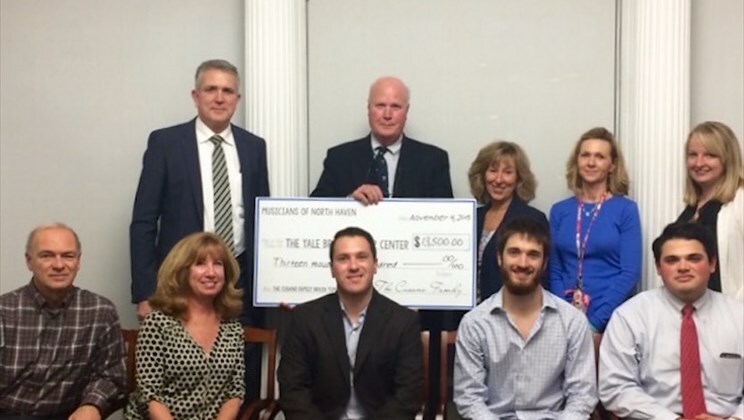 One hundred percent of donations to The Cusano Family Brain Tumor Fund are given directly to the Yale Brain Tumor Center and are under the care of Dr. Piepmeier. Your donations go toward research, namely better understanding particular types of tumors and their patterns for incidence, but also toward an educational undertaking for patients and their families. I am pleased to share that I am collaborating with the Yale Brain Tumor Center on a educational effort to be featured directly on Yale’s website. It is our collective hope that this effort will give patients access to new findings, but also to help the patients and their families to better understand their disease. As a donor, you will have the ability to visit the site and learn about what your dollars are providing, and I cannot wait to share that with you all. So, with that background information, the details! This year, in addition to the venue change, we are excited to have two new bands join us, one of which Stephen is the drummer in. The first band, Ja2m, is a duo headlined by Jonathan Moore and Aaron Mannes. If you were at my wedding, you will remember them singing “I’ll Be” as Ashley walked down the aisle or while they entertained everyone during cocktail hour, and we could not be happier to have them back with us. Their style of music is fun and will certainly offer something for everyone. The second act is Wise Old Moon, an Americana band from right here in Hartford, Connecticut. Proudly, we’re keeping it in the family once again as Stephen is their drummer. It is perfect music for an end-of-the-summer night overlooking the water. Hopefully you already have it marked down in your calendar, but if not, save the date for September 16th for what will be the best year yet! My family and I are so excited to hold this concert again and hope that together, with your support, we’ll help the doctors at Yale save another life.